If you had an experience travelling to or living in Russia, you might have traveled to two of the most attractive tourist destinations, Moscow and Saint Petersburg. If you haven’t, you may want to go there when you get a chance. 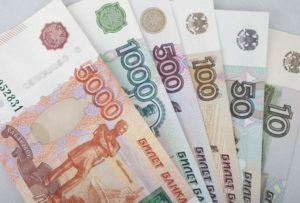 Assuming that you currently have a travel ticket to Russia and you will be travelling in a couple of week, then you need to consider several things. There are 5 differences living in Moscow and Saint Petersburg. Knowing those can bring you to the right place of your choice according to your preference. However, if the travel ticket allows you to visit the two cities, then the following information will give you information about which city that you should spend more days in. Here are 5 differences living in Moscow and Saint Petersburg that you should know before travelling to those cities. If you travel to Moscow, you will see that the city moves so fast. Meanwhile, when you see St. Petersburg, you will experience a slower pace of life than in Moscow. The difference is due to the fact that people in Moscow live in stressful place as they are more productive than those in St. Petersburg. Thus making Moscow people always rush to workplace. A number of 12 million people live in Moscow and most of them ride cars. This makes Moscow’s streets always look crowded. Besides, both cities differ in urban city planning. Streets in St. Petersburg opt for straight and rectangular crossroads. 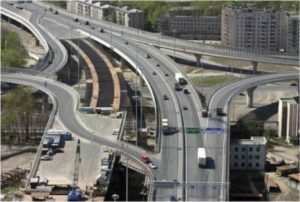 Meanwhile, those in Moscow are more convenient and circular that creates a dynamic movement. There are only few metros in both cities. 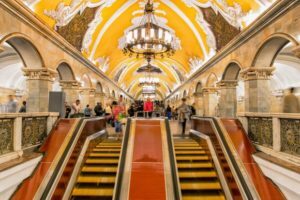 As metro is an important public transportation in Russia, especially when you do not rent car to travel, you need to know about the differences of Moscow’s metros and St. Petersburg’s ones. One difference is the layout of metro and the format of signs and maps. However, you will get use to it in several days if you are a Russian. Another difference is metros in Moscow are shakier, but the city has more metros with electronic signs, new plastic seats and WiFi. The last difference is the design of subway stations. Although both cities have beautiful subways stations, Moscow’s are considered having more beautiful ones. You need to note that you should avoid rush hours if you prefer less crowded metros in both cities. Winter in both cities can be really challenging. Make sure you do not travel in winter to both cities, especially Moscow, unless you will experience flight delays. 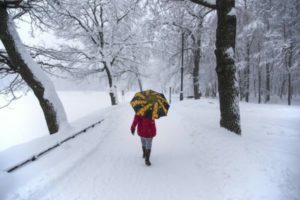 In December 2016, Moscow only got six minutes of sunshine. Meanwhile there is normally an hour of sunshine in the same month. Regarding climate, people in Moscow consider those in Saint Petersburg are blessed. This is because St. Petersburg has frequent rainy days year-round. Besides, the freezing cold is not so terrible as in Moscow during winter. Another beautiful thing in St. Petersburg is that the fog adding its romantic atmosphere. You should be familiar with the kindness of Russian people if you have experience travelling there. However, there is slight difference of kindness in both cities. People in St. Petersburg are considered more benevolent and cultured. Thus making them kinder and gentler. Meanwhile, those in Moscow are a little bit rough due to their stressful life. People in both cities speak in Russian, but they use different vocabularies for the same object. For example, they call a building entrance pod’ezd (Moscow) or paradnaya (St. Petersburg). In Russia, you may need to use your fashion knowledge because Russian people mind their fashion. For example, if you opt for casual style, you are Muscovites. People in Moscow get use to casual style for everyday activities. Women even wear tennis shoes and that’s common. However, when they go out to town, they will add more accessories and walk in more fashion than they always be. Meanwhile, fashion in St. Petersburg is different. You will see most women wear skirts or dresses and they always wear high heels whenever they go. When you talking about travelling to both cities, you should consider cost of living there. Although both cities are capitals, the cost of living in St. Petersburg is cheaper than that in Moscow. Everything about St. Pete is cheaper those than in Moscow, either it is the cost of hotel rent, restaurant bills or transportation. For example, metro costs 36 rubles in St. Petersburg, while it costs 50 rubles in Moscow. You can read halal restaurant in Moscow., most popular foods in Petersburg during ramadan. and most popular foods in Moscow during ramadan fasting. However, there is an exception when it comes to events. Events held in St. Pete cost more money than those in Moscow. You may want to know about interesting facts of Moscow victory day parade. If you opt for beautiful scenery, romantic atmosphere and more attractions, you should spend more time in St. Petersburg. However, if you prefer dynamic life and more events, Moscow probably suits you well. Those are 5 differences living in Moscow and Saint Petersburg.